Virgo is made of a soft tiger stripe fur wearing a removable knit outfit. His face is hand painted soft sculpture with glow-in-the-dark eyes. 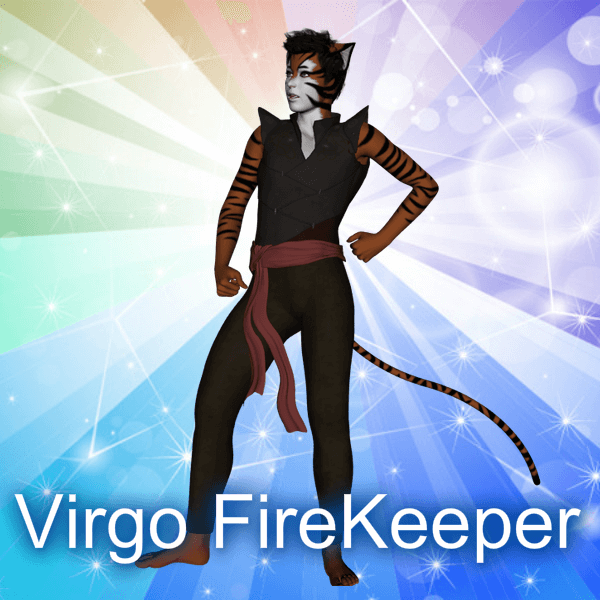 Virgo FireKeeper’s mostly the quiet type. If he has a strong opinion on something, he’ll express himself, but that’s not especially common. If the situation has need of it, he can take the leadership role, though. With the unexpected death of his mother and his father leaving to discover the cause only to find it was Nyxus and be murdered himself for it, Virgo became both mother and father to his younger brother, Keru. When Athalia agreed to watch his younger brother, the burden of being a mother for his brother was lifted, since he really wasn’t much good at it – he preferred the role of brother. Though he has yet to openly admit his feelings for Athalia, they do exist. When he accidentally saved Cristiane’s life, he found she had more than friendship in mind very quickly. To his dismay, she tries everything in her power to convince him that she’d be perfect as his mate. Seeing Athalia’s patience during these conflicts only strengthens his feelings for her and angers Cristiane further.